Everybody loves the Avengers. Everybody loves Halloween. I am always down for holiday specials, especially when they’re separate and/or don’t interrupt important stories. 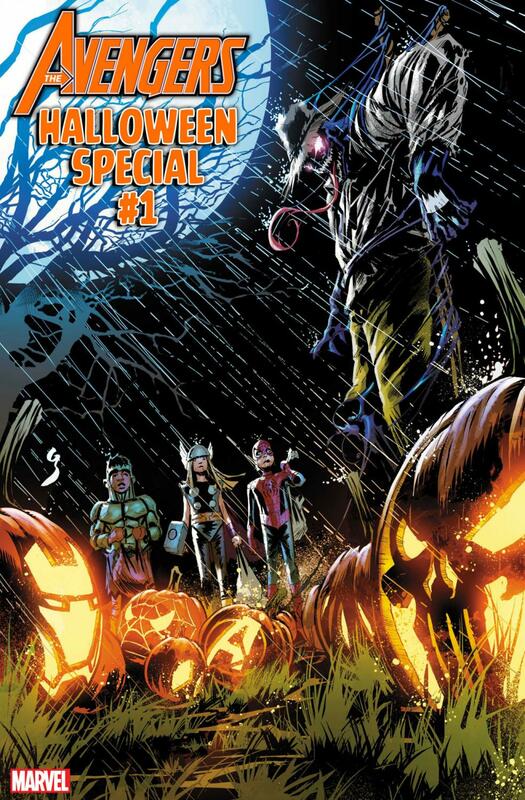 Avengers Halloween Special #1 throws several stories together in a way that perhaps could have been done better, but will nonetheless be fun to read like ghost stories by a fire. My main problem with this anthology is the order of the stories. Each one feels inspired by different monuments of the mystery or horror genres, and they’re of course all great on their own. But they’re kind of like Scooby Doo, then Stranger Things, then John Carpenter’s the Thing. All great, but if you read that list backwards, the order is off. It feels like you’re starting on your most intense, strongest note and then fading out. I think if you could rearrange the stories in just a few spots, the whole book would flow a lot better. They’re still pretty exciting though. My personal favorite was the first one starring Matt Murdock, even though it kind of doesn’t make sense when you think about some of his abilities. Due to their short page space, they’re all of course very fast paced, so I think some people may miss a detail here or there and want to go back and reread. The art is generally hit or miss to me, but at the same time I think the artists all succeed in embracing the tone of each script exceptionally. When it’s called for, it can get pretty rough and they take the gore as far as they can, which is important to making the stakes feel legitimate. The colorists all really drive it home. Strong, violent reds, somber violets, faint light casting a shadow over a face; a few examples of how valuable they all are as assets to the medium of storytelling. And thanks to the format, we’re never in one place for too long, which means the pages have a great deal of variety to them and never feel stale. If you love horror, I’d say you can pick this one up and have a great time with it. It does suffer a little bit from its own order of events, but there’s a fair amount of variety to be found in all five tales. They can’t all be everyone’s cup of tea, but the artists and colorists bring different energies to the book and it’s better for it. You’ll have fun with this one, I’m sure.